Residential metal roofing is generally made of steel, aluminum, or copper. Rolls of 24- or 26-gauge steel sheets are given a metallic coating to prevent rust, followed by a baked-on paint finish. Aluminum sheets don’t require the metallic coating but do get painted. Copper, is neither coated nor painted, because it weathers without corroding. It is sometimes used for special features, such as the roof of a prominent bay window, gutters, and downspouts. Steel roofing products are coated with either zinc (galvanized) or a mixture of aluminum and zinc (galvalume or zincalume). Of the two, galvalume offers the longest life. The coatings are offered in multiple thicknesses—the thicker the coating the longer the life, and the higher the cost. 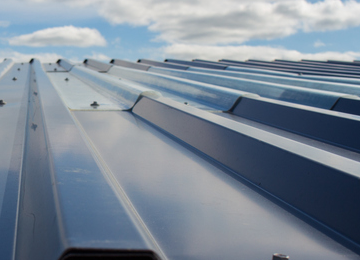 Another metal roofing product comes in a rolled form of various widths of so-called standing seam metal. The material is “seamed” together using a special seaming tool that is run vertically up the panel to seal the joints and prevent water intrusion.